Taking a break, whether for lunch or an afternoon cup of coffee, is an essential part of most people’s workdays. Research has shown that building breaks into our day helps keep us sharp and productive on the job. But after diving into data on workday breaks, Baylor University psychological scientists Emily Hunter and Cindy Wu discovered that many of our assumptions about the best way to take a break are wrong. “Surprisingly little research investigates employee breaks at work, and even less research provides prescriptive suggestions for better workday breaks in terms of when, where, and how break activities are most beneficial,” Hunter and Wu write. In many offices, the typical culture is to work throughout the morning, with breaks saved for lunch or the late afternoon. Hunter and Wu hypothesized that – much like workers all over the world – people get the most out of taking a break once they’ve already been hard at work for most of the day. But, after analyzing data collected from nearly 1,000 breaks, they found that a mid-morning break provides far more benefit than a late afternoon one. Hunter and Wu also examined several other factors that influence how restful and restoring a break can be: Does it matter if you take a walk or stay in the office? Is there an ideal length of time? This survey included questions designed to track how many minutes the break lasted, where it took place, and what kind of activities people engaged in during their break. Questions also assessed people’s mental resources, such as energy levels, concentration, and motivation. The survey also quantified people’s physical state with questions about common complaints like eyestrain, headache, and back pain. Throughout the five days of the study, participants completed 959 total break surveys – an average of two surveys per person per day. At the end of the workweek survey period, participants completed a longer survey assessing their job satisfaction and burnout symptoms. An analysis revealed two key characteristics that defined breaks that best aided recovery: taking a break earlier in the day and engaging in enjoyable activities during a break. Simply put, there appear to be distinct benefits to spending some time early in the day doing something enjoyable. 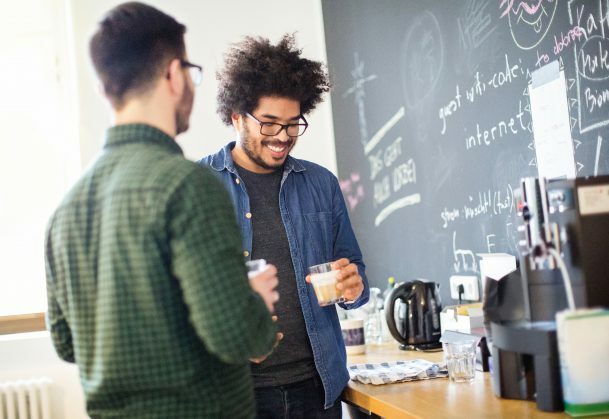 “Breaks later in the day seem to be less effective, so it is perhaps even more important for employees to make the most of their afternoon breaks via preferred activities,” the researchers write. Ultimately, Hunter and Wu’s study also found evidence that a late-morning Starbucks run may hold benefits beyond improved productivity; participants who took “better breaks” during the study also reported fewer physical symptoms, like back pain, as well as increased job satisfaction.